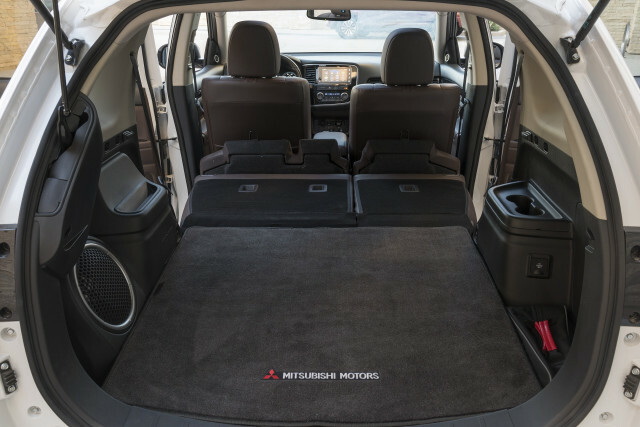 Not too many people will ever drive the 2018 Mitsubishi Outlander PHEV, the plug-in hybrid version of the company's mid-size crossover utility vehicle. So it was fitting that the company launched the vehicle on dusty roads in the back country of Catalina Island: roads that not many people are allowed to drive on. Located two dozen miles off the coast of Los Angeles, Catalina Island is a nature-lover's destination vacation spot, offering tons of hiking and snorkeling. But it's not a place for car people. The main mode of on-island transportation is golf carts, and even those you can use only in the bustling town of Avalon. When we ventured outside the city, it was 25 miles of tight dirt roads up and down the dry hills and buffalo ranges. 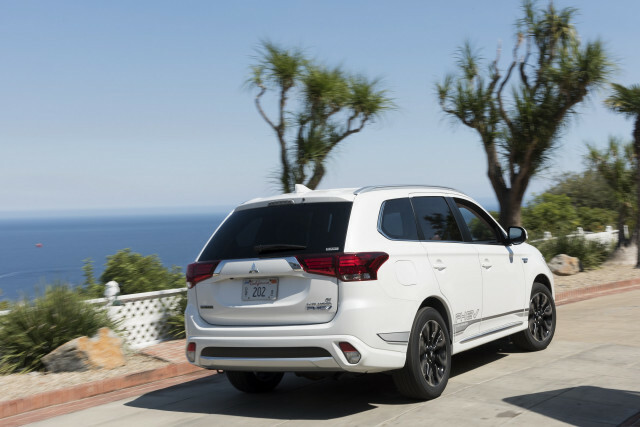 Thankfully, Mitsubishi has built a plug-in hybrid SUV that's more than up to the task. Unless you want to spend more than $50,000, there's really no other plug-in vehicle on sale today that's well-suited for rough terrain. The Outlander PHEV isn't a true back-country off-road vehicle, but it manages to pack four-wheel drive (what Mitsubishi calls its S-AWC, or Super All-Wheel Control) into a roomy package that felt right at home on the dirt. 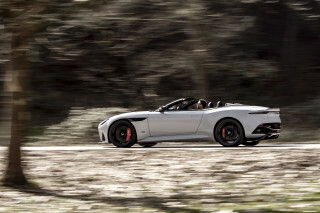 That was especially true once I dialed the six-level selectable regenerative braking to its harshest setting (B5) for extra control on the downhill paths. CHECK OUT: 2018 Volkswagen Atlas 7-seat SUV unveiled; plug-in hybrid coming, but when? Mitsubishi has learned a few lessons from not only the first version of the Outlander PHEV (sold in Japan and Europe for several years), but also the bubble-shaped electric minicar known as the i-MiEV. The cells and the battery management software both evolved out of that electric car, Mitsubishi says. 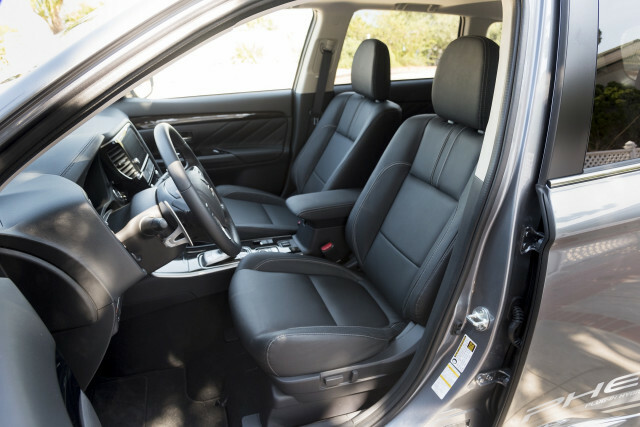 The superbly quiet operation when the Outlander PHEV is in all-electric mode comes thanks to lessons learned from both the i-MiEV and the gasoline versions of the mid-size SUV. The crossover utility's low center of gravity (the battery is, unsurprisingly, mounted as low as possible) meant that handling on the dirt roads was not a challenge. Even some sudden braking (seriously, who expected to see a school bus way out there?) didn't result in any sense of danger or loss of control, and the steering feel was direct enough to feel the rocks in the road without too much float. In short, anyone who buys the Outlander PHEV for normal U.S. family usage should drive away happy. 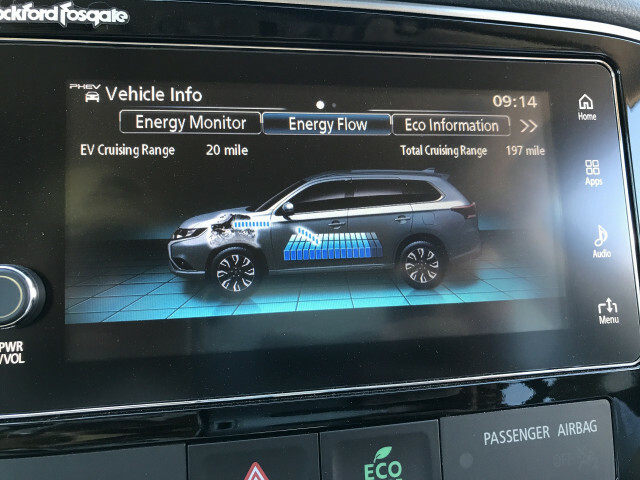 We only barely drove the Outlander PHEV on paved roads, but it was easy to imagine cruising down the highway using B0, the setting with the least amount of regen braking. 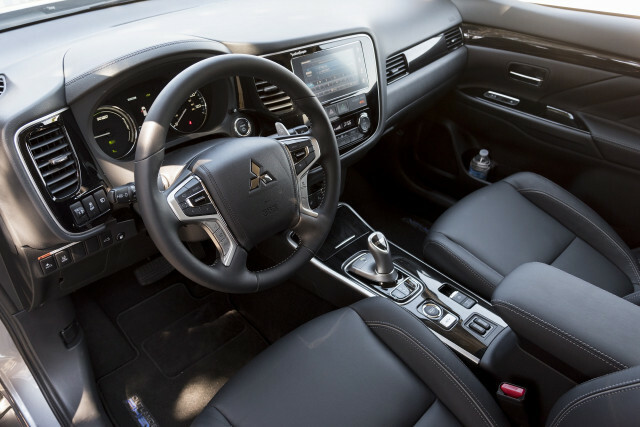 The Outlander isn't the world's plushest crossover, but occupants will enjoy plenty of creature comforts: a pair of USB ports, both Android Auto and Apple CarPlay, two standard 110-volt outlets to use at tailgate parties—the engine will kick on to power your blender, if need be—and satellite radio. 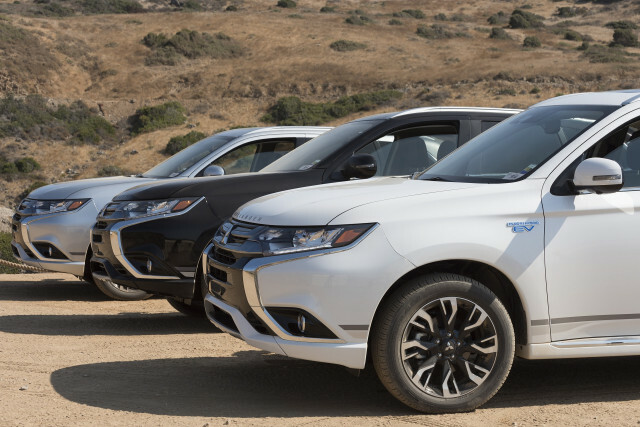 Mitsubishi isn't quite ready to talk about the Outlander PHEV's all-electric range just yet. Company representatives said they have full confidence its battery rating will beat any other plug-in hybrid crossover or SUV on sale in the U.S. 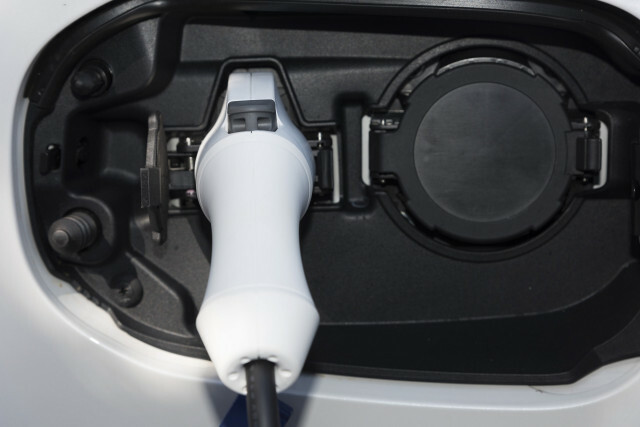 Right now, the big plug-in hybrids with the most range are the BMW X5 xDrive40e, the Volvo XC90, and the Porsche Cayenne e-Hybrid—all rated at 14 miles of battery power alone, according to the EPA. The 2018 Volvo XC60 T8 plug-in hybrid, which entered the market only in July, gets an 18-mile rating. That means the Outlander should get at least 19 miles, but we have reason to think that it'll be a bit more than that, due to what we saw on the infotainment screen during the drive. 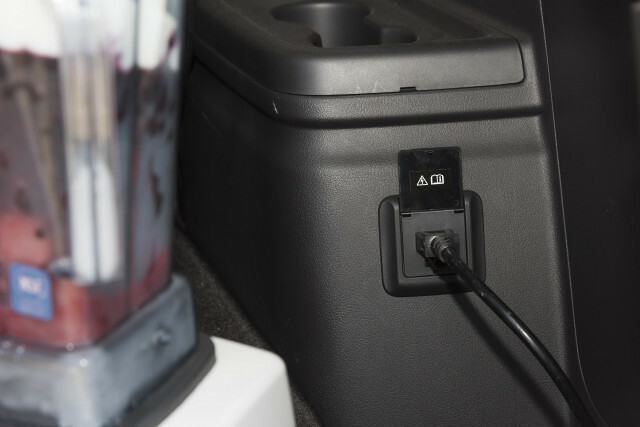 When we put the plug-in Outlander into battery-charge mode, we were able to get the pack up to roughly seven-eighths full, and the on-screen "EV Cruising Range" said we could go 20 miles. Exactly how this distance is calculated is part of an automaker's black magic department, so we won't say for sure the Outlander PHEV will have a 21- or 22-mile range, but we'd be happy to bet on 20 miles. Mitsubishi says official EPA numbers are due in about a month. 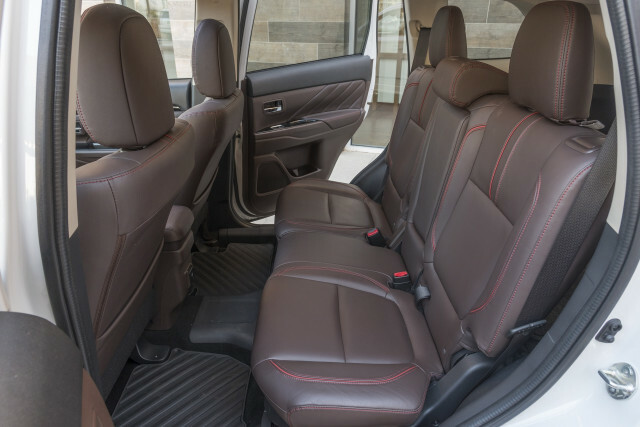 What's perhaps most impressive is that you get all of this for a base price of just $35,535 for the SEL trim level, including the mandatory delivery fee. The Outlander PHEV's 12-kilowatt-hour battery pack qualifies it for a federal income-tax credit of up to $5,836, which will bring that price down to less than $30,000 for most people after incentives. The higher-level GT trim starts slight above $41,000, still more than $10,000 cheaper than the $54,000 level where the XC60 T8 starts. 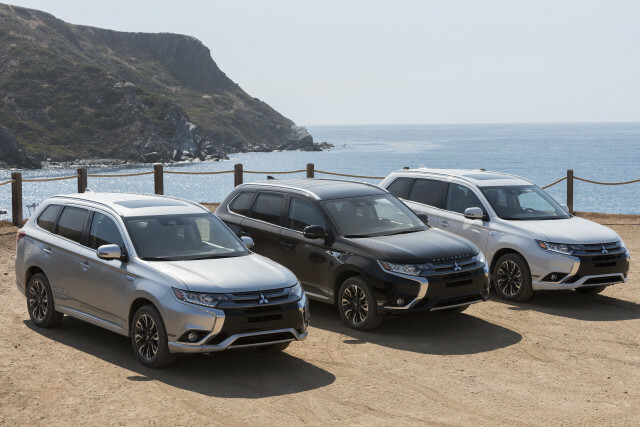 The Outlander PHEV is a 50-state vehicle, and 85 percent of Mitsubishi's 360 U.S. dealers are plug-in certified, so finding one shouldn't be hard starting in January. 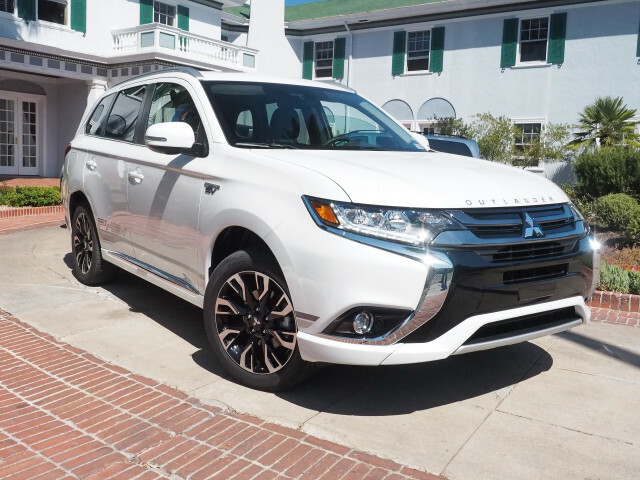 If you're in the market for a bigger crossover but only want to pay half of what your tony neighbor paid for hers, the plug-in Outlander will likely be at the top of your list. Even if you've never wondered about where your local Mitsubishi dealer may be.